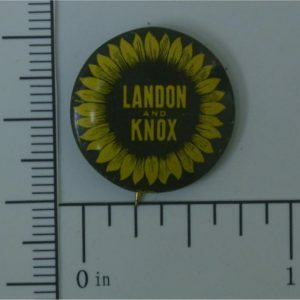 Landon and Knox campaign buttons features the colorful sunflower and sizes range from .5 inch to well over 6 inches in diameter. 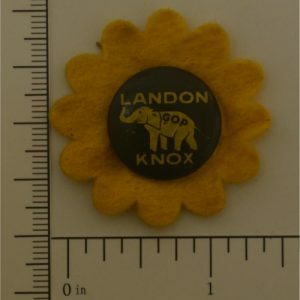 Alfred Mossman Landon, known as Alf Landon (September 9, 1887 to October 12, 1987), was an American Republican politician, who served as the 26th Governor of Kansas from 1933 to 1937. 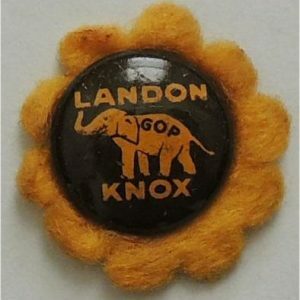 He was best known for having been the Republican Party’s nominee for President of the United States, defeated in a landslide by Franklin D. Roosevelt in the 1936 presidential election.